Next, you'll vary the effect of adding spot color by adding a solid block of the color and then a block of the color screened to 50%. The two areas will appear to be different colors even though you have used the same Pantone custom color on the same color separation. First, you'll make a selection for the solid block of color and fill the selection using a keyboard shortcut. 1 Using the rectangular marquee tool ( ,), drag a selection marquee around the white square area in the upper right corner of the image (bounded by the two guides). 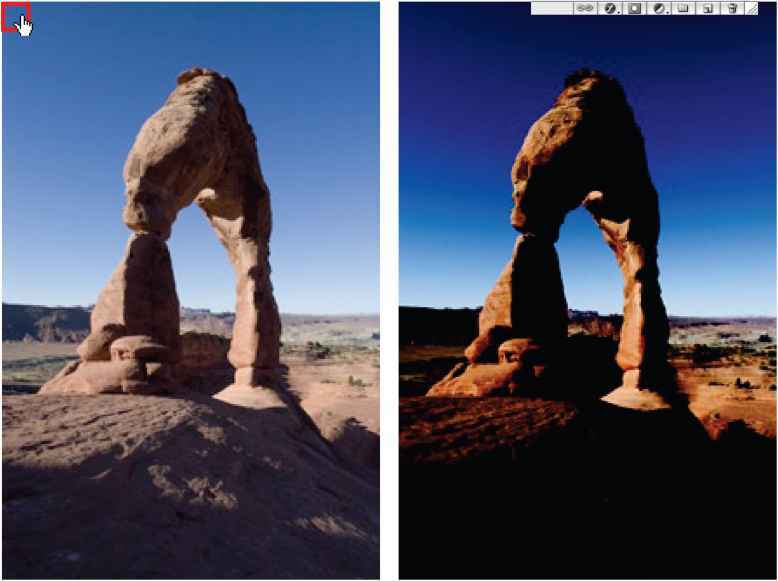 2 Hold down Alt (Windows) or Option (Mac OS), and press Delete to fill the selection with the foreground color. Because you are in the PANTONE 124 C channel, the foreground color is PANTONE 124 and fills the square with solid color. Now you can add a lighter block of spot color to the image. 3 Make a rectangular selection directly below the left hammer and bounded by the guides. 4 In the Color palette, drag the color slider to 20% to set the value for the new block of color. 5 Hold down Alt/Option and press Delete to fill the selection with a 20% screen of PANTONE 124. 7 Choose View > Show Extras or View > Show > Guides to hide guides.